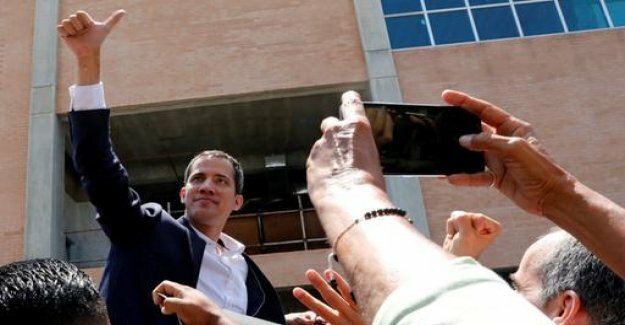 to the cheers of his followers is returned to the self-appointed interim President Guaidó to Venezuela. Him, threatens arrest. Venezuela's Parliament and self-appointed transitional President Juan Guaidó is returned to Venezuela. He traveled to the capital of the airport of Maiquetía. There he was greeted by enthusiastic supporters. Guaido said that he came to create the exchange. He had no fear. He will lead the anti-government protests, to which he had called. It is still unclear how the socialist government with him will deal with it. Guaidó against a ban on Leaving the Supreme court. Several ambassadors of countries that recognize Guaidó as interim President, including the Germans, expected Guaidó at the airport of Caracas. Should be the socialist Maduro government is on to him, will be your last mistake, had Guaidó threatened. Prior to his arrival, anti-government protesters gathered in Caracas and other major cities to new protests. The people are demanding the resignation of President Nicolas Maduro and fair and free elections.